Seems I have a hamsa series going. Often called the Hand of Miriam by Jews, or the Hand of Fatimah by Muslims, this middle-eastern symbol features three fingers and two thumbs. Don’t ask me why. A good luck charm, it’s said to ward off the evil eye…cast by those who would be envious of what good fortune you may have. Lots of folks wear a hamsa as a talisman around their necks. But since bad luck can occur right at home, frequently in the form of cooking disasters, I recommend a household hamsa —especially in the kitchen. Done in foil-lined, plasticized packaging like coffee bags and tea bag envelopes, the resulting art can be wiped clean of cooking grease, sprays from spills, dust and grime. 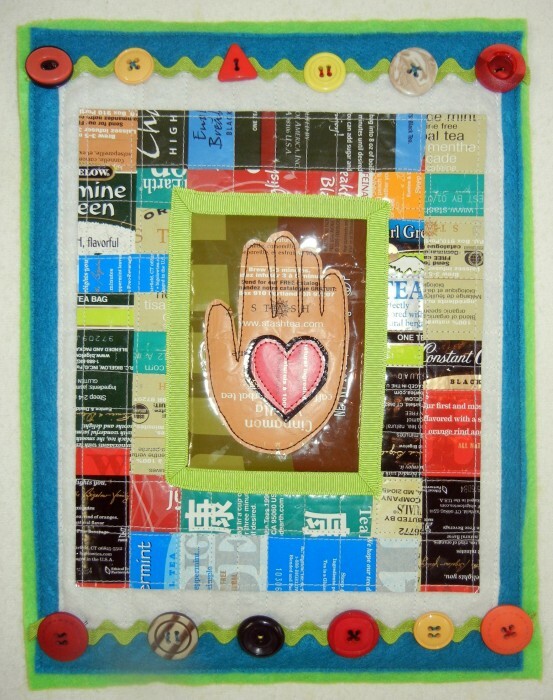 I teach this class as a workshop for trash-stash quilting, using the sample shown above, or for a westernized version, the hand-in-heart motif below. 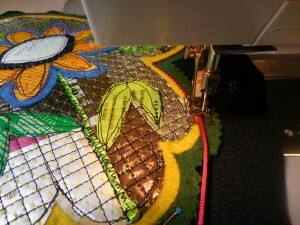 First time I ventured into hamsa territory was for a 2011 Quilt Alliance challenge; lots of shiny packaging made it impossible for this amateur photographer to capture a good representation. Recently, I answered another challenge with Eyes Wide Open as the theme. 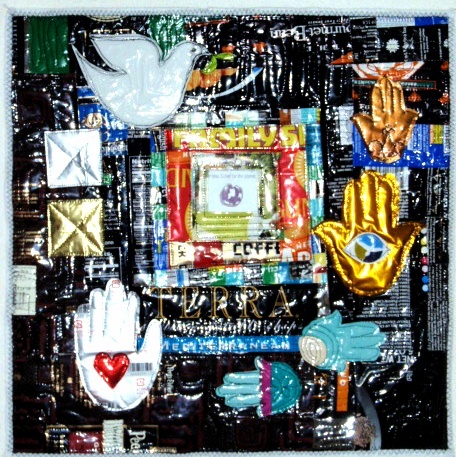 Right away, I thought of a hamsa with an eye, done out off coffee and tea bag packaging to reference the caffeine that literally opens my eyes, and the need to reduce and recycle that informs my trash stash quilting. Two other inspirations guided my creative pathway. First was an article in the Summer SAQA (Studio Art Quilt Associates, Inc.) Journal referencing the keynote speaker at the SAQA annual conference. Namita Gupta Wiggers is an art historian, and director and co-founder of Critical Craft Forum. She pushed for art quilts to take a place of power. Art in and of itself, instead of simply as a reference to the older, more traditional form of a bed covering. To do that, she encouraged breaking out of the rectilinear picture plane, and redefining the medium through the use of materials other than cloth. Hmmmm. 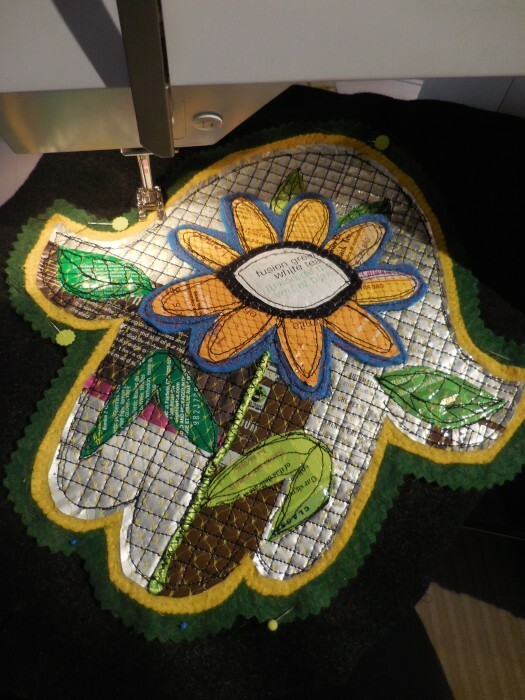 Another inspiration from a few years back was Pamela Allen’s Black-Eyed Susan art quilt, where plastic doll eyes peeped out from the centers of a bouquet of blooms. 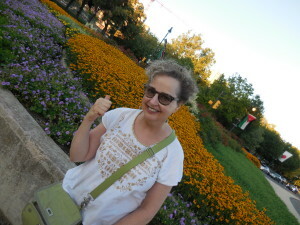 Thus was born my Black-Eyed Susan Hamsa! Securing top layers to bottom layer of black felt. Couching satin cord over felt edges. Black-Eyed Susan Hamsa, by Eleanor Levie, 2015, 14″ x 24″ ? Photo by Carl Harrington, who is angling to get out of the photo business! 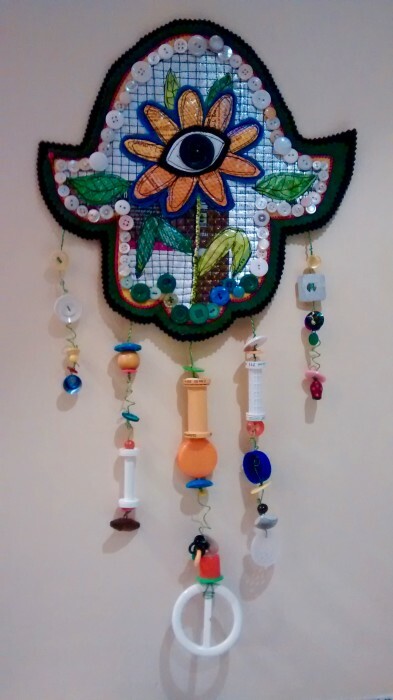 This entry was posted on Friday, July 31st, 2015 at 8:14 pm	and is filed under Art + Quilt, Flowers, Inspiration, Recycled Art, Unusual Materials. You can follow any responses to this entry through the RSS 2.0 feed. You can leave a response, or trackback from your own site. Love, love love it! The danglies! The eyeball! The buttons! It’s all great! Your art is very meaningful but also fun. I love how you use objects like buttons. Beautiful work.